Revenue in the Jerseys, Sweatshirts & Pullovers (women & girls) segment amounts to US$164,807m in 2019. The market is expected to grow annually by 3.8% (CAGR 2019-2023). In global comparison, most revenue is generated in United States (US$33,504m in 2019). In relation to total population figures, per person revenues of US$22.39 are generated in 2019. The market for Pullovers includes knitwear, sweatshirts, jerseys and sweaters for women and girls that are usually worn as the outermost layer of clothing (with the exception of outdoor jackets or coats). Reading Support Revenue in the Jerseys, Sweatshirts & Pullovers (women & girls) segment amounts to US$164,807m in 2019. 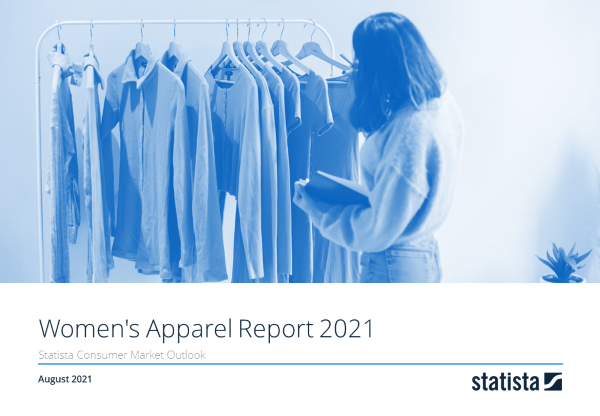 Reading Support The Jerseys, Sweatshirts & Pullovers (women & girls) segment is expected to show a revenue growth of 4.1% in 2020. Reading Support The average revenue per person in the market for Jerseys, Sweatshirts & Pullovers (women & girls) amounts to US$22.39 in 2019. Reading Support In the market for Jerseys, Sweatshirts & Pullovers (women & girls), volume is expected to amount to 10,227.28 m pcs. by 2023. Reading Support The market for Jerseys, Sweatshirts & Pullovers (women & girls) is expected to show a volume growth of -0.2% in 2020. Reading Support The average volume per person in the market for Jerseys, Sweatshirts & Pullovers (women & girls) amounts to 1.38 pieces in 2019. Reading Support The average price per unit in the market for Jerseys, Sweatshirts & Pullovers (women & girls) amounts to US$16.18 in 2019. Reading Support With a market volume of US$33,504m in 2019, most revenue is generated in United States.